Memorial services for Ian Slatem will be held on Wednesday 7 February at 7 pm; Presentation area, CityRock Gym, 173 Republic Road, Randburg. We would love you to attend and celebrate Ian’s life with us. We welcome you to share your memories, pictures or stories. We will be concentrating on removing Senna, Pompom weed, etc. Please join in and do your bit. Please bring with some gloves – but ask Theo to give you the list when you book for this! Hamerkop Kloof is a long kloof, the lower part of which is owned by the Hamerkop Mountain Trust while the upper part is privately owned.The kloof is home to over 200 trad climbs along its length, of which most are Grade 18 and below. Many of the routes are also one pitch long, making the area a safe and fun venue for people starting trad climbing. Hamerkoop has one of the shortest walk-ins of any of the Magaliesberg Kloofs, making it a popular crag for families with young children. The 4-kloofs hike this year is a brand new route that will attempt to navigate the four main kloofs in the area, namely Junction Kloof (new), Tonquani Kloof, Boulder Kloof and Cederberg Kloof. 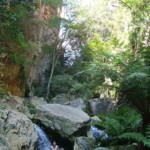 The hike will be mostly in the kloofs so expect to boulder hop, wade through water and scurry up or down gullies. The route will take us up the hill from the parking in the direction of Red Gully. From there we will traverse across the escarpment to the top of Junction Kloof. This kloof is narrow and slightly overgrown, but makes for a great hike through ferns and beautiful undergrowth. This will eventually bring us to Tonquani Kloof which we will traverse from top to bottom. From there we cut back to Boulder Kloof and exit throuh Cederberg Kloof. A parking fee of R40/car will apply. Non-members are welcome. Please contact Bennie on 082 850 0941 for more details. . . .